The Tiffany Network is doubling down with Hondo and Deacon. CBS has renewed its SWAT TV show reboot for a second season. The high-action program is a reboot of the 1975 original, starring Steve Forrest, Robert Urich, Rod Perry, Mark Shera, and James Coleman — itself a spin-off of The Rookies on ABC. A CBS police drama, SWAT stars Shemar Moore, Stephanie Sigman, Alex Russell, Jay Harrington, Lina Esco, Kenny Johnson, and Peter Onorati. The police drama centers on Sergeant Daniel “Hondo” Harrelson (Moore). A lifetime Los Angeles local and former Marine, Hondo has been tapped to lead a new “last stop” Special Weapons and Tactics unit. His team includes the seasoned David “Deacon” Kay (Harrington), newcomer Jim Street (Russell), canine trainer Christina “Chris” Alonso (Esco), and expert driver, Dominique Luca (Johnson). They work under the supervision of L.A. Metro Captain Jessica Cortez (Sigman), a dedicated professional who also has a personal connection to Hondo. The first season of SWAT is averaging a 1.02 rating in the 18-49 demographic and 6.33 million viewers. In terms of its demo numbers, the first season has been a top-ten performer for the network. 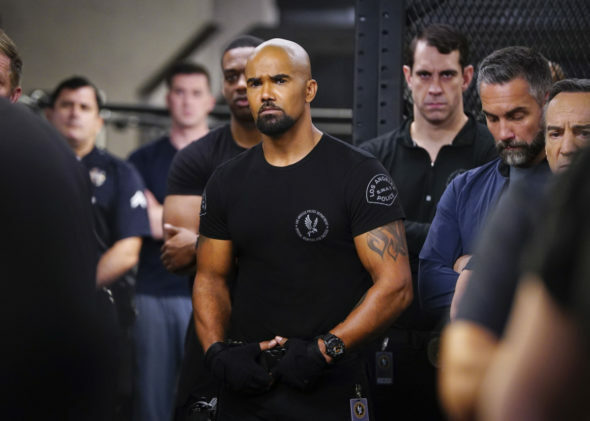 Find out how SWAT stacks up against the other CBS TV shows. CBS has enjoyed some success with new TV series, this year. Today, the Tiffany Network also renewed its SEAL TEAM TV show for a second season. The two series join Young Sheldon, which was previously renewed for season two. Check out the CBS press release, for more. What do you think? How do you like the first season of the SWAT TV series reboot? Did you expect CBS to cancel or renew it for season two? Glad to see SWAT renewed. Shemar is great in this roll. I love this show and can’t wait for season. One of the best new shows. I love SWAT. I am so happy it was renewed for a second season. I love Shemar. The whole cast is awesome. Best show on the air! !